This wide crochet headband pattern is perfect for all types of weather. It’s nice for the summer because it has a nice open lace; but can also be used in the fall and winter weather, not only to keep your hair back, but to keep you warm as well. If you love textures combined with a bit of lace, then this headband is for you. It features an open diamond design with a vertical row of front post stitches to border the diamonds. The lace gives the band a nice stretch and looks beautiful when worn over the head. It’s also a nice stitch for a cowl. It’s cute as pictured in the bottom left, but you can easily make it longer and wider for a super cozy winter cowl. 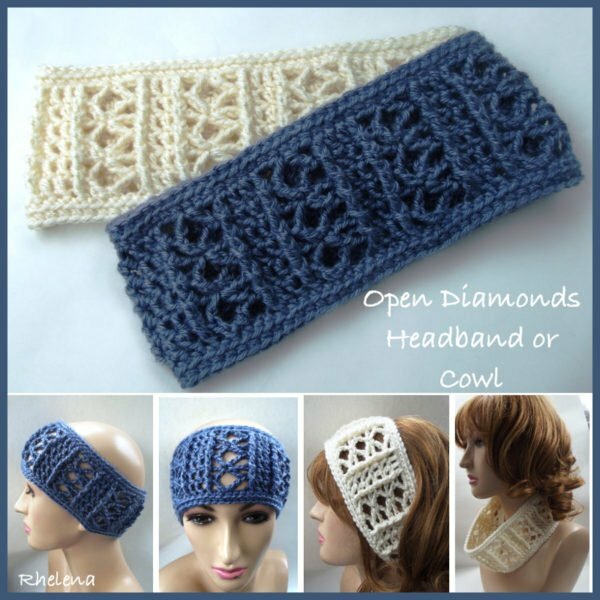 Other free headband patterns include the easy breezy headband or cowl, the bead and lace headband, and the slanted puffs summer headband. If you are a beginner, you might want to check out this crochet headband pattern, which features a very basic stitch pattern. There is also a free pattern roundup here for crochet headbands if you’re looking for something more narrow and summery. The crochet headband pattern is available in two women’s sizes, but can be adjusted as needed in the stitch multiple that is provided. If making it for children you might want to narrow it down a bit by doing one less repeat of the pattern rows. Fpedc: Yarn over, insert hook around post going in from front to back and back around to front, yarn over and pull through (3 loops on hook), Yarn over and pull through 1 loop on hook (3 loops on hook), (Yarn over and pull through 2 loops) twice. Instructions are given for a small headband. Special instructions for larger size are in parenthesis. Ch 72, (81) or any multiple of 9; join with sl st in first ch being careful not to twist chs. Rnd 2: Working into bls only, sc in same st as join and into each st around; join with sl st in first sc. Rnds 6-8: Rep rnds 4 and 5 ending with rnd 4 at rnd 8. Rnd 10: Same as rnd 2. FO. If you are looking for a wide crochet headband to keep your ears nice and toasty in the cold weather you can check out this collection of crochet ear warmer patterns.